Etsy recently announced a partnership with Intuit that provides their Self Employed version of their popular Quickbooks package for a special yearly discounted rate. While on the surface this announcement sounds like a fantastic opportunity for Etsy sellers it has a number of issues from a tax and bookkeeping perspective . 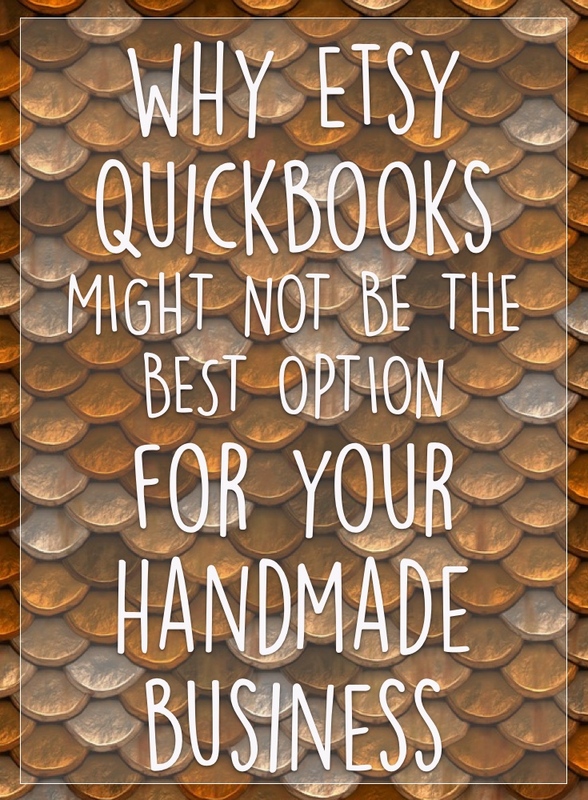 The version of Quickbooks that integrates with Etsy is their "Self Employed" one - this is their basic, bare-bones revenue and expense tracker designed specifically for self employed businesses, with the added bonus of Etsy data integration. Wonderful, you say: I'm self employed, would love to have my Etsy orders and fees all imported for me and it's all I think I need to do my taxes. What's the problem? The problem is that most Etsy handmade sellers are not only self employed businesses, they are self employed manufacturing businesses. This distinction is really important as it changes everything about the way you need to report your end of year revenue and expenses to the IRS. This means that using Quickbooks Self Employed is unfortunately only going to cover one relatively small part of your reporting obligations. If you make your own products, you need to be reporting the material costs you incur to create your products as part of your COGS ("cost of goods sold"). This is reported on your Schedule C form that is due in April each year. As Quickbooks Self Employed only allows you to enter indirect expenses and has no allowance for inventory tracking, you'll need to ensure that you are calculating your inventory and manufacturing activities separately and then manually updating your tallies in QB as a separate "COGS" expense category in order to be able to report this correctly. You'll also need to remember to only enter your non-inventoriable expenses to avoid them being counted twice in your tallies (as they will be already being claimed via COGS). If you don't do this and enter in all materials as you buy them, you'll just end up with a summarised list of supply expenses claimable only in the year that they were purchased. 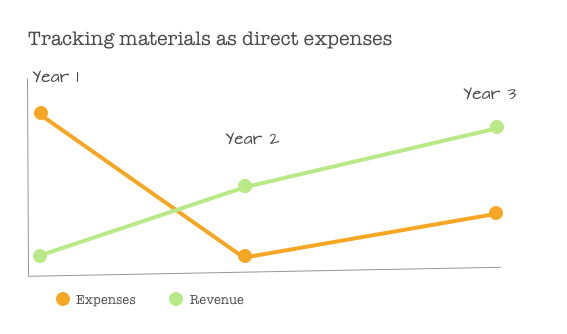 Claiming your material expenses directly as a "supply" rather than COGS can cause big problems down the track if you still have inventory stock on hand at the end of the year. Why? While it might feel great to have a huge expense total to offset your revenue in year 1, this is only a good thing if you make a lot of money. Now, think about what happens in year 2 and 3 when your sales increase but your expenses decrease due to the greater leftover inventory stock on hand (i.e. you are using materials from the excess stock you purchased last year). You'll effectively lose the ability to claim the expenses you are using to produce your products: your expenses to offset your revenue have already been claimed in a prior year leaving you with a situation that will almost certainly attract the most tax to be payable. Claiming your material expenditure as one-off costs is also not the approach that the IRS requires for inventory based business, so doing this may cause the IRS to scrutinise your returns and you may need to recalculate past returns and amend - definitely not a situation you want as a small time and cash-strapped business! 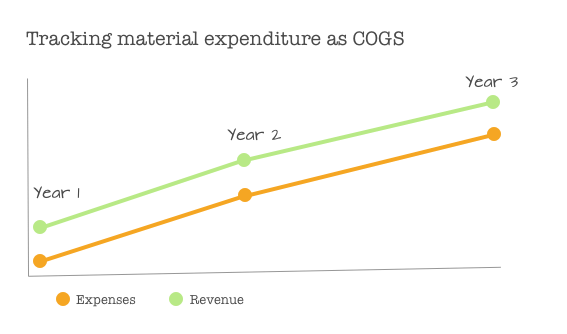 Tracking your material expenditure as COGS as you can see in the diagram above means that you always have a direct relationship between your revenue and your expenses - as your revenue increases, the cost of manufacture increases (you make and sell more products). This means that you are always claiming a constant amount of expenses against your revenue: this is something that the IRS expects to see if you are filing as a manufacturer. It also means that there are zero surprises come tax time, which is got to be a good thing right? Take advantage of the cheap expense and revenue tracking available with Quickbooks Self Employed (while it's cheap that is: remember the special Etsy rate is only for the first 6 or 12 months and after this you'll be charged the full monthly rate), but remember that you'll also need to find a secondary system to calculate your material usage and COGS. This means finding either a specialised spreadsheet or using perpetual inventory tracking software. You'll also need to be very diligent about removing any expenses imported into the Quickbooks system relating to direct material expenditure and moving them across to your inventory system to avoid double costing. Forget Quickbooks Self-Employed and instead use an all-in-one bookkeeping + inventory software solution like Craftybase or Quickbooks Premier. Craftybase is designed specifically for craftspeople and allows you to track expenses, revenue and full COGS as you go - no manual calculations or other software required. At the end of the year, just generate your Schedule C report and all your expenses, revenue and inventory values will be there ready for your bookkeeper to review and submit.